"Table and Counter Functional Ceramics"
Sunshine is working as a potter and travels the country as a lecturing and demonstrating artist. She graduated with a BA in Studio Art from CSU at Sacramento, in 2006. In 2010 she received her MFA in Ceramics from Utah State University. In 2013 she was named as an emerging artist by both Ceramics Monthly and National Council on Education for the Ceramic Arts. She was a ceramic resident for a period of time after graduate school most notably a long term resident at the Archie Bray Foundation in Helena, MT(2012-2014). 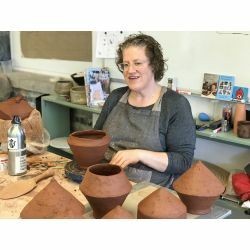 In 2015 after running a successful crowdsourcing campaign to fund a studio set up, she launched Sidecar Studios, a studio for ceramic artists and other creative community activities. She is currently focusing on developing lines of functional ware and developing her studio business.